Aidaprima which is currently being constructed at the Mitsubishi shipyard in Japan has been set loose from the build dock to continue the final phases of construction. The new class cruise ship which will be operated by German based Aida Cruises was looking just stunning as it left the construction dock in Nagasaki, Japan. Aida Cruises let everyone know via social media which will now make many dedicated Aida cruisers very excited. The vessel is still located near the yard where the final phase of construction will continue. The interior areas of the ship will begin to take shape and it won’t be long until the crew arrive to begin setting up their departments. Aidaprima is a new generation class ship for the German cruise line and shifts construction trends from Europe to Japan. The 124,500 gross ton vessel is the largest ever built for the cruise line but that will be surpassed when the first of two new 180,000 gross ton ships will be completed in 2019. Until then passengers can enjoy the very best of the Aidaprima with all the latest onboard features including UV-transparent Foliendom, Aida Beach Club, Skywalk and a ton more is still to be revealed. 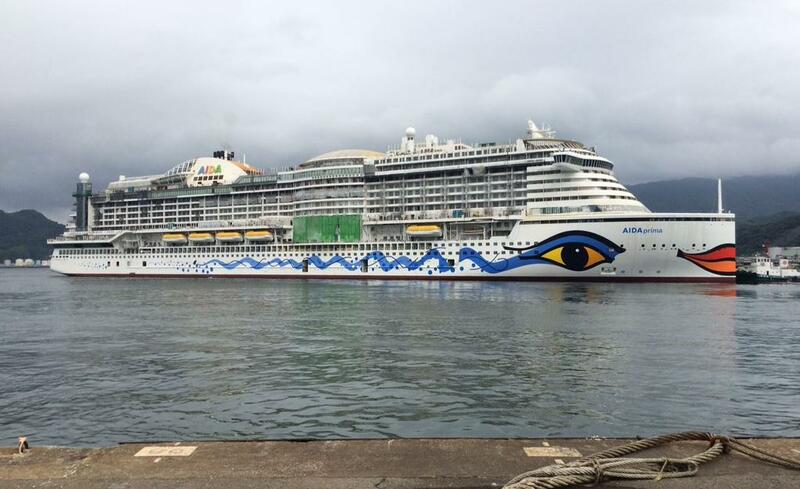 Aidaprima begins its 50 day maiden voyage on October 1, 2015 from Yokohama, Japan. The 3,300 passenger ship will sail from Hamburg, Germany in 2016.